Thanks to everyone who participated in Foundations on the Hill 2019 and PolicyWorks Instittute 2019. We look forward to seeing you at next year's events at the JW Marriott in Washington, DC. Don't forget to mark your calendars. Foundations on the Hill (FOTH) is a two-day event that brings together hundreds of foundation leaders from across the country to meet with Congress to discuss issues of critical importance to philanthropy. FOTH is the one time each year when philanthropy speaks with a strong, collective voice on Capitol Hill. With January 2019 marking the start of the 116th Congress with new congressional leadership, #FOTH19 is timed perfectly to help current and new elected officials understand the value of philanthropy to the social and economic fabric of our country, and to stress the importance of philanthropy and government working as equal partners at the table to ensure the continued health of our sector. Presented by United Philanthropy Forum in partnership with Alliance for Charitable Reform, Foundations on the Hill aims to inform and educate Congress about philanthropy; create visibility for philanthropy on Capitol Hill; advocate on issues affecting foundations and communities; and encourage Congress to view foundations as a resource and partner on key public policy issues. The Alliance for Charitable Reform's Leadership Breakfast will be held as part of Foundations on the Hill. Foundation trustees and staff participating in Foundations on the Hill will work with your regional or national philanthropy serving organization to schedule meetings on Capitol Hill. We welcome seasoned FOTH participants and newcomers alike. You’ll receive all the training and support you’ll need through the Delegation Captain for your state or region, who can also answer any questions you may have about your delegation’s participation in FOTH. All Delegation Captains represent Forum members. Foundations on the Hill is for members of United Philanthropy Forum and their foundation members. Foundations who are not members of a national or regional philanthropy serving organization within the Forum are also welcome to participate and will be assigned to a delegation from their region by the Forum. Be sure to join us on March 11-13 for the most important advocacy event for philanthropy on Capitol Hill in 2019: Foundations on the Hill 2019. Foundations on the Hill is sponsored by U.S. Trust. We are thankful for their support of this event to bring philanthropy's key policy issues front and center on Capitol Hill. United Philanthropy Forum’s PolicyWorks Institute is the primary opportunity for regional and national philanthropy-serving organizations (PSOs) to take a “deep dive” together over several days to strengthen their policy and advocacy work. PolicyWorks Institute is for members of United Philanthropy Forum who work on advocacy and policy issues for their PSO or are interested in building skills and capacity in this arena and for foundations that belong to PSOs that are focused on advocacy and public policy as funders or serve on the board of a PSO policy committee. Join the policy staff from regional and national PSOs and their foundation members to enhance your organization's capacity to engage more effectively in advocacy, public policy and government relations work. You’ll experience plenary sessions to inspire and inform your policy work, concurrent sessions to help build your skills for engaging in policy, and many opportunities to share and connect with your peers. Be sure to join your PSO policy colleagues in DC this March for #PWI19. Please contact Matt Hennessy, Senior Manager of Policy (202-759-6920), with any questions. Come pick up your name badge and other materials at the registration desk. In policy work, progress is often incremental and credit is widely shared – making it challenging to claim and communicate victories to key audiences with a stake in your success. This workshop will explore tips and techniques for identifying, framing, and delivering success stories to the audiences most crucial to your organization’s continued impact. Designing and Building Policy: How the Sausage Gets Made! The universe of ways for PSOs and foundations to influence public policy is expansive. Importantly, there are also limitations on these activities based on each organization’s IRS categorization. This conversation will present the various ways that the philanthropy sector affects policy and tools they utilize to do so. We will unpack what “policy” means, dispel myths about how the philanthropy sector can support advocacy, clarify the rules for advocacy and lobbying, and examine how to choose the right approach to most effectively achieve your policy goals. This session will explore various ways PSOs have influenced policy, from creating new legislation, attempts at blocking proposed legislative changes, and preserving current programs. The session will also present the Forum’s Policy Decision Filter. Enjoy a relaxing dinner with your PolicyWorks friends or retreat to your room for recuperation. Sign-up at the registration desk for dine arounds. Join us for breakfast and a policy discussion with a research presentation from Nicolas Duquette of the Sol Price School of Public Policy on a universal charitable tax credit. The work that philanthropy is leading to prepare for Census 2020 serves as an excellent case study on how the philanthropy sector can influence and partner on policy and advocacy work to improve key outcomes. This session will share the lessons learned, so far, from this process in order to apply them to future advocacy on other issues that philanthropy invests in. Micro Talks invites expert speakers to each present on a topic of interest for five minutes. Participants then discuss these topics further. The session will end with time for an all-group discussion. This session promotes group exchange and discussion on the various challenges that PSO’s and foundations face when working to influence public policy. The session utilizes human centered design to guide the conversation and ideation. It is a critical time for philanthropy to regroup and reassess how we educate and activate policymakers on both sides of the aisle. This session will discuss strategies to more effectively influence policymakers to view the philanthropy sector as a key ally in their work. The goal is to better understand how to harness the voice and resources of philanthropy to ensure policies are put into place that both support the sector as a whole and support the issues and populations philanthropy invests in. Hear from seasoned Hill staff about what they are thinking when they meet with constituents and what they want to hear from you. This session will discuss how to utilize the time you have with Congressional staff to convey your message and gain their understanding and support. What is the secret sauce for having a successful Hill meeting? This conversation will provide tips and advice from seasoned FOTH participants on how to get the most out of your meetings with members of Congress. In preparation for Hill visits, Alliance for Charitable Reform will host a breakfast and bring in top Hill staffers to share their insights on the 2019 session. Panelists: Andrew Grossman, Chief Tax Counsel for Ways and Means Democrats; Lori Prater, Policy Director and Tax Counsel to Rep. Mike Kelly (R-PA), senior member of the Ways and Means Committee; Tiffany Smith, Chief Tax Counsel for Senate Finance Committee Democrats; and Mark Warren, Chief Tax Counsel for Senate Finance Committee Republicans. Amanda Andere is the CEO of Funders Together to End homelessness and has spent over fifteen years working in the nonprofit and public sector as a leader committed to addressing social justice, economic opportunity, and security through advocacy for systemic change. Prior to joining Funders Together to End Homelessness as their CEO, she served as the CEO of Wider Opportunities for Women, a national advocacy organization. Currently, she serves as a board member of the United Philanthropy Forum and the James Madison Political Science Alumni Board, as well as on the steering committing for The Campaign for Housing and Community Development Funding. Previously she served as an adjunct professor at George Mason University teaching Nonprofit Management, Executive Director of FACETS and Vice President of Cornerstones; who have similar missions of preventing and ending homelessness as well as breaking the cycle of poverty. In the past Amanda has served the community in the following capacities; board member of the National Council of Women's Organizations, Reston Association, Nonprofit Roundtable, Take Heart Kenya, and Fairfax County Alliance for Human Services. As well as program committee member/coach fo r Leadership Fairfax. She is a graduate of the 2008 Leadership Fairfax Class and 2009 Nonprofit Roundtable Future Executive Director Fellowship. Amanda is an ordained Deacon at Martin Luther King Jr. Christian Church. In 2012, Amanda was honored by Northern Virginia Magazine as Northern Virginian of the Year and by the Fairfax County Chamber of Commerce as Emerging Influential of the Year. In 2013, she was honored as Best of Reston, Lady Fairfax, and the Smart CEO Brava Award. She loves to kickbox, dance, and spend quality time with family and friends. Jocelyn Bissonnette joined FCCP as the Director of the Funders Census Initiative. For nearly a decade, she served as Director of Policy & Advocacy for the National Association of Federally Impacted Schools (NAFIS), where she represented public school districts that encompassed American Indian reservations and military installations before Congress and the Administration. At NAFIS, she led the organization’s grassroots and grasstops advocacy, engaging members across the country and national stakeholders in several successful advocacy campaigns around the $1.4 billion Impact Aid program, school infrastructure investments, and private school vouchers. In 2017, she served as president of the Committee for Education Funding, a coalition of 110 member organizations that advocate for increased Federal investments across the education continuum. Jocelyn earned a B.A. in Economics with a minor in Political Science from the University of New Hampshire and a Masters in Policy Management from Georgetown University’s McCourt School of Public Policy, where her capstone focused on the undercount risk of American Indians and Alaska Natives in the 2020 Census. She also completed a policy fellowship with the Institute for Educational Leadership and an Executive Certificate in Nonprofit Management from Georgetown University. She is a proud Rhode Islander. Kari McCann Boutell joined the Iowa Council of Foundations as President in 2015. Kari works directly with the Board of Directors and oversees organizational activities including program development and management, membership recruitment and retention, as well as education and outreach for the purpose of strengthening and growing philanthropy in Iowa. Kari started her career in philanthropy in eighth-grade as a youth grantmaker. She earned her B.A. in Nonprofit Management from the University of Northern Iowa in 2011 and completed her M.A. in Philanthropic Studies at the Indiana University Lilly Family School of Philanthropy in May 2013. Kari was the Director of Nonprofit Partnerships & Grantmaking at the Community Foundation of Greater Dubuque before joining ICoF. She serves on the UNI Nonprofit Leadership Alliance Advisory Board, Women’s Giving Circle grants committee, University of Northern Iowa Leisure, Youth and Human Services Advisory Council, and the St. Mark Youth Enrichment Board of Directors where she participates in the development committee and chairs the governance committee. Kari is a Jr. Achievement classroom volunteer and teaches spin classes at her local YMCA/YWCA. Kari also does consulting work and supports youth philanthropy across the state and nationally. Kyle Caldwell began his tenure as president and CEO of CMF on November 1, 2018, bringing more than 25 years of government, and nonprofit and philanthropic sector experience. He has also been a supporter of CMF as a volunteer for many years and was formerly a member and co-chair of CMF’s Public Policy Committee. Prior to his appointment with CMF, Kyle, a Michigan native, was executive director of the Dorothy A. Johnson Center for Philanthropy at Grand Valley State University, one of the country’s leading academic centers for philanthropy. He previously served as an intern, and then later as executive director of the Michigan Community Service Commission in the Engler and Granholm administrations. A champion of public/private partnerships, Kyle helped launch and then lead the ConnectMichigan Alliance (CMA) that created a $20 million endowment to support volunteerism that engaged both state government and philanthropy in a one-of-a-kind statewide campaign. CMA merged with the Michigan Nonprofit Association (MNA) and Kyle became its president and CEO. There, he championed the work of nonprofits and foundations to help build a stronger ecosystem for philanthropy. Throughout his work in government and in foundations, Kyle has helped develop strategies and programming initiatives that strengthen the work of public and private grantmakers. Most recently, he served as the director for the Pathways to Opportunity Program at the Charles Stewart Mott Foundation where he helped evolve the Foundation’s approach to addressing poverty to focus on education. He earned both a bachelor’s and master’s degree in communication from Western Michigan University. Both WMU and Lansing Community College, where he earned an associate’s degree in photojournalism, have bestowed Kyle with exemplary alumni awards. Cecilia Chen as the Policy Director, advances NCG’s mission to build healthy, thriving and just communities through public policy. Prior to joining NCG, Cecilia served as a Deputy Attorney General at the California Attorney General’s Office advancing the Attorney General’s policy priorities around criminal justice reform and childhood trauma. Cecilia was previously the Associate Director of Policy at the Center for Youth Wellness where she led statewide efforts to prevent and address childhood adversity and the impact of Adverse Childhood Experiences on children’s health. She was also the 2011-2013 Thurgood Marshall Civil Rights Fellow at the Lawyers’ Committee for Civil Rights of the San Francisco Bay Area. Cecilia graduated from Tufts University and received her J.D. from Boston College Law School. She lives in San Francisco with her husband and fur baby Sherlock. In addition to being an unabashed dessert lover (especially ice cream), Cecilia enjoys exploring the Bay Area and trekking internationally. She just completed a hike through the world’s largest cave and is always looking for her next adventure. Matthew L. Evans is the Director of Public Policy and Special Projects at the Southeastern Council of Foundations. He is responsible for leading the organization’s public policy efforts at both state and federal levels. He provides important thought leadership for the region on how public policy issues impact philanthropy and our communities, while also developing, implementing and managing activities that facilitate the engagement and education of SECF members in the area of public policy. Additionally, in this capacity, Matthew advocates legislative goals, manages and oversees grassroots efforts, recruits industry partners and works to nurture and preserve partnerships with external organizations around the country. With over a decade of experience, Matthew comes to SECF with a unique skill set and an extensive background in lobbying, government relations and advocacy, including work with membership associations. Prior to his role at SECF, Matthew was tasked with building the first ever advocacy department of one of the largest charter school networks in Georgia. Along with serving as a primary point of contact for elected officials, he also led efforts to create and maintain a coalition of students, teachers, school administrators and community members to serve as grassroots advocates. Most of Matthew’s professional career was shaped during his time in Washington, D.C. From 2007 until 2017, he held multiple positions that gave him direct experience in working with elected officials and associations, where he led advocacy efforts for several national organizations. Matthew is excited to bring his skills and experience to SECF and lead its work to promote and defend philanthropy in Washington and in statehouses throughout the Southeast. Matthew is also no stranger to the South – he is an Atlanta native and a proud alumnus of Tennessee State University, where he obtained a bachelor’s degree in English. Andrew Grossman serves as the Chief Tax Counsel for the Committee on Ways & Means. He comes to the Committee by way of the Joint Committee on Taxation, where he served as Legislation Counsel for the seven years. In that role, he was the Joint Committee’s primary attorney on all matters related to the individual income tax. He also advised Members of Congress and congressional staff on matters related to tax incentives for higher education, a variety of Federal excise taxes, tax-related disaster relief provisions, and taxpayer compliance. Prior to joining the Joint Committee staff, Andrew was an associate at Skadden, Arps, Slate, Meagher & Flom LLP, where he worked for four years, advising clients on a wide variety of tax matters. He has spoken widely on Federal tax issues, and the legislative process generally, for industry associations, at colleges and law schools, and at the District of Columbia Bar Association (where he serves as a member of the tax section’s steering committee). Andrew received his law degree, and an LLM in tax, from New York University School of Law, a BA from Amherst College, as well as a Masters of Education from George Washington University. Prior to attending law school, he worked as a middle and high school math teacher for three years, in Boston and New York City. Lyle Matthew Kan is the Vice President of Research and Communications at Funders for LGBTQ Issues, where he leads the organization’s analysis of trends, gaps, and opportunities related to LGBTQ grantmaking, oversees external affairs, and manages strategic partnerships. An expert on LGBTQ philanthropy, his reports and infographics on the scale and character of LGBTQ grantmaking having been cited by numerous academic journals, think tanks, non- governmental organizations, government agencies, newspapers, blogs, and other media. His presentations on how LGBTQ communities connect with a wide range of grantmaking priorities and on how institutions can be more LGBTQ-inclusive in both their grantmaking and internal practices have helped inform thousands of decision makers in philanthropy and beyond. With a strong commitment to improving the wellbeing of LGBTQ people and social justice more broadly, Lyle serves as the chair of the research and data-sharing working group at CHANGE Philanthropy and a member of United Philanthropy Forum’s Public Policy Committee. Lyle is also a member of the advisory council for The City University of New York (CUNY) LGBTQI Student Leadership Program and part of a planning committee working to create an American LGBTQ+ Museum in New York City. He previously served on the board of directors for I’m from Driftwood, an online LGBTQ story archive, and sat on the grants review committee for the Queer Youth Fund at Liberty Hill Foundation, which invested approximately $5 million in work that empowered LGBTQ youth. Prior to Funders for LGBTQ Issues, Lyle led development and communications efforts at Stonewall Community Foundation. Before that, Lyle worked at the Foreign Policy Association and in the private sector specializing in business development and branding. Lyle holds a B.A. in individualized study from New York University’s Gallatin School of Individualized Study and a M.Sc. in political sociology from the London School of Economics and Political Science. When not traveling for business or pleasure, he calls New York City’s East Village home. Nick Johnson serves as Senior Vice President for State Fiscal Policy at the Center on Budget and Policy Priorities, a Washington, D.C-based research and policy institute. He directs the Center’s State Fiscal Policy division, which works to advance equity, accountability, and economic opportunity through stronger state budget and tax policies. Over his more than 20-year career as a researcher at the Center, Johnson has written extensively on a range of state fiscal policy issues. He also serves as an advisor to the members of the State Priorities Partnership, a network of independent state-level policy organizations. In 2004 Johnson was awarded an Ian Axford Fellowship in Public Policy and served as an advisor to the New Zealand Treasury and the New Zealand Ministry of Social Development, conducting analysis of that country’s programs of tax relief and cash assistance for low-income families. Johnson holds a graduate degree from Duke University's Terry Sanford Institute of Public Policy and an undergraduate degree from Yale University. He came to the Center in 1996 from the staff of the U.S. Senate Committee on Agriculture, Nutrition & Forestry. Aryah Somers Landsberg as the Vice President of Programs has more than 12 years of experience with immigrant and refugee issues. She joined GCIR in February 2016. She earlier served as director of advocacy at KIND championing administrative and legislative protections for unaccompanied children. While a consultant, she co-authored UNHCR’s “Children on the Run” report on the root causes of migration of unaccompanied children from Central America and Mexico to the U.S. As a Fulbright Scholar in Guatemala, she researched safe repatriation and reintegration of children removed from the U.S. to Guatemala. Aryah has also represented hundreds of children in immigration removal proceedings as a children’s attorney in New York at The Door and in Arizona at the Florence Project. Internationally, she worked in Egypt and Ecuador advocating for refugee children. She has published law journal articles, practice advisories, white papers, statements, and talking points. Aryah earned a J.D. from Georgetown University Law Center, an M.A. in Arab Studies from Georgetown University, and a B.A. in International Affairs from George Washington University. Aryah loves spending time with her family, outdoor walks, and trying out all kinds of amazing cuisine. Debbie is executive VP and COO for the Council of Michigan Foundations, where she leads the team in design, coordination and implementation of the organization’s strategic vision and framework, suite of services, special initiatives and embedded diversity, equity, and inclusion efforts. Current leadership initiatives include Census 2020, Truth, Racial Healing & Transformation, Great Lakes One Water Partnership, Launch Michigan (education) and the Impact Investing HUB. Debbie brings her previous experience supporting collective impact models, especially utilizing network and systems change practices, to CMF’s leadership initiatives. Prior to joining CMF, Debbie spent six years with CMF member Rotary Charities of Traverse City, where she led design and development of their capacity building arm, NorthSky Nonprofit Network of which she was executive director. Her 25+ years of experience in leadership and public-private partnerships also includes serving as co-founding board member, managing director and CEO of the Youth Orchestra of the Americas, assistant manager of the New York Philharmonic, president of McKeon & Associates Inc., and executive director of the Elgin Symphony. A global citizen and civic leader, Debbie has worked in 40 countries across six continents and is an active member of several nonprofit boards, including the Michigan Association of United Ways, Michigan Humanities Council and Groundwork Center for Resilient Communities. Debbie has a bachelor degree from Central Michigan University and Small Business Administration Business Development Counselor certification from Grand Valley State University in addition to credentialing in governance, succession planning, resource development and strategic restructuring. Dawn Melchiorre joined Forefront in March 2016 and serves as the Chief Operating Officer. As part of the Leadership Team, Dawn leads Forefront’s education programs, member networks, statewide partnerships, and strategic initiatives. Dawn also oversees Forefront's public policy and advocacy work. Previously, Dawn was Senior Director of Programs at the Greater Chicago Food Depository. Positions previous to that include Vice President of Clara's, Director of Program Partnerships at the Greater Chicago Food Depository, and Policy Outreach Director at Voices for Illinois Children. Dawn has also served on several nonprofit boards. She earned a BA in political science and communications from Loyola University of Chicago, an MS in public service and public policy from DePaul University, and an MBA in Nonprofit, Public, and Organizational Management from Concordia University. Karla Mercado supports SCG's public policy efforts and manages Philanthropy California initiatives. Prior to SCG, Karla was the director of special events for a public relations firm where she developed and coordinated strategic networking events for local nonprofits, institutions, and corporate clients, with the goal of expanding their community involvement and exposure. She began her work in the nonprofit sector as a case manager for the Los Angeles Chapter of Catholic Big Brothers Big Sisters, where she supported and maintained records for youth and their mentors to ensure positive youth and match development. Karla has a B.A. in Sociology from California State University, Los Angeles and an M.P.A. and certificate in Non-Profit Management from the California State University, Northridge. Huong has over 13 years of experience in the nonprofit sector. Prior to joining GCIR, she worked at Asian Americans/Pacific Islanders in Philanthropy (AAPIP) supporting the National Giving Circle Network. Her experiences also includes providing behavioral health and recovery services and working in the field of Positive Youth Development. Huong earned her MSW from San Jose State University and her BA in Asian American Studies from the University of California, Los Angeles. Outside of work she serves on the board of EBAYC in Oakland and is a core member of the Hella Heart Oakland Giving Circle. She also enjoys traveling, staying active, and spending time with her family and friends. Nikhil Pillai is Counsel for the Bolder Advocacy Initiative at Alliance for Justice. He consults with and trains nonprofit organizations on the rules and strategies for legal and effective advocacy. Nikhil received his J.D. from the Georgetown University Law Center and B.S. from the Ohio State University. Before joining AFJ, Nikhil was Associate Counsel at Working America, the community affiliate of the AFL CIO. In that role he was responsible for drafting and negotiating operational agreements, advising staff on prospective legal concerns, and ensuring compliance with campaign finance and lobbying laws. Prior to that, he was a law fellow at AARP. In his free time, Nikhil enjoys cooking, playing music, and watching trashy reality TV. Cynthia Pritchard is the CEO of Philanthropy Delware and has over 30 year’s executive planning, administration, communications and programmatic experience in the nonprofit and private sectors. She has a degree in Psychology/Business with an emphasis in Personnel Administration from Mansfield University of Pennsylvania. Pritchard has served as executive staff for United Way of Greater Augusta, Workforce Plus (regional Department of Labor office); ACS, Department of Medicaid Services - customer call center; National Multiple Sclerosis Society; American Red Cross; Nationwide Insurance and Highland Manor Nursing Home. She is considered a strategic thought leader in the areas of workforce development, early childhood, youth career development, adult education, civic engagement, volunteerism, health care, public policy, mental health, and arts/culture/historic preservation. She is a Certified Fund Raising Executive, raising over 7.5 million dollars as a professional and volunteer. She was named to Who’s Who of Business Professionals in 1994. In 1998, she was selected by the DAR as the Outstanding Woman under 35 in Pennsylvania. She has served board member and leader of multiple local, state and national nonprofit organizations ranging from health care, arts and culture, historic preservation, youth development, and aging. She has done critical work galvanizing effective coalitions and partnerships through her orientation to collaborative processes and inclusion based mindset. She has developed and implemented fund development programs, community impact models, and provided strategic and operational direction for multiple organization. She has developed and taught coursework/seminars nationwide on grant writing, fundraising, outcome measurement, collaboration, and collective impact, volunteer engagement, advocacy for social workers, employee onboarding, board development, and conflict resolution. Tony Richardson joined the Foundation in January 2015 as a Program Officer. He earned a Bachelor’s degree in Politics and African-American Studies from Oberlin College in 2005 and a Juris Doctorate’s degree from The Ohio State University Michael E. Moritz College of Law in 2009. Tony has professional experience in law, government, and education. Sue Santa is one of the nonprofit sector’s leading experts on advocacy, policy, legislative and regulatory issues. She has served in senior leadership positions with both Council on Foundations and The Philanthropy Roundtable. Her knowledge of policy, government relations and law is broad and diverse, with professional experience in for-profit, nonprofit and government. Prior to her work serving philanthropic organizations, she spent nearly a decade with NASCAR/International Speedway Corporation, working on government relations, legal and business development. Sue practiced law at a leading D.C. law, government relations and lobbying firm. Her first experience in Washington D.C. was on the staff of United States Senator Jeff Bingaman (D-NM), and she retains her standing in the New Mexico Bar. Sue is currently an adjunct faculty instructor at Columbia University School of Professional Studies, where she teaches policy and advocacy. She is a consultant on philanthropic, policy and development issues. Sue earned her JD from Washington University and her B.A. in Journalism and Political Science from University of North Carolina at Chapel Hill. Carly Rothman Siditsky is a Communications Consultant with more than a dozen years of experience in communications, fundraising, and non-profit leadership. She was Director of External Affairs at New Jersey Policy Perspective, a state policy think tank, before joining the Center on Budget and Policy Priorities in Washington, D.C. to manage external communications for the State Priorities Partnership. Previously, she was a journalist at The Star-Ledger in New Jersey and coached nonprofits on communications strategies. She holds a B.A. from Yale University and an M.P.A. from New York University, and is pursuing a J.D. at Rutgers Law School. Jamila Thompson serves as the legislative director for U.S. Representative John Lewis (GA). In addition to managing and developing the office’s policy team and operations, she is directly responsible for appropriations, budget, trade, tax, foreign affairs, defense, human and civil rights, oversight, poverty, and other policy areas. Prior to joining Congressman Lewis’ staff in 2007, Ms. Thompson worked as a legislative assistant for Rep. Barbara Lee (D-CA). Before coming to Capitol Hill in 2001, she was a volunteer coordinator and translator for various non-profit organizations. Recognized as a Young Woman of Achievement by the Women’s Information Network (WIN) and the first Women's Campaign Forum "Hill's Got Talent Class of 2009," Ms. Thompson was appointed to the Mayor’s Advisory Commission on Caribbean Affairs in Washington, D.C. and served as a 113th Congress Senior Fellow with Stennis Center for Public Service Leadership. In Spring 2015, Goucher College named Jamila as one of the inaugural recipients of its Distinguished Alumnae and Alumni Award; she is also an alumna of the University of London’s School of Oriental and African Studies (SOAS). Jamila is co-founder of the Congressional Legislative Directors Association; a member of Women of Color Advancing Peace and Security (WCAPS), Women in International Trade (WIIT), Women in International Security (WIIS), Black Professionals in International Affairs; and is vice-chair of finance for the Caribbean-American Political Action Committee. Bob Tracy as director of Public Policy and Communications, coordinates public policy engagement and leads its government relations activities in St. Paul and Washington, D.C. for the Minnesota Council on Foundations. He encourages MCF members to incorporate advocacy and public policy into their grantmaking and to act as resources for other grantmakers. He leads MCF’s efforts to advocate for a positive environment for philanthropy and charitable giving and on advancing policies in Minnesota that encourage prosperity and equity and eliminate disparities. Bob has experience as a grantmaker, nonprofit manager and public program administrator. Since 1994, he has lobbied at the Minnesota State Capitol for groups including the Minnesota AIDS Project, Minnesota Coalition Against Sexual Assault and Minnesota Legal Services Coalition. He also has experience producing public affairs programming for tpt's Minnesota Channel. Bob graduated from St. Paul's Macalester College with a bachelor's in political science. Some of you may know Bob from his community and political work in Saint Paul. Bob and his husband reside in St. Paul and occasionally retreat to their second home in Italy for adventures in Tuscan home repair. What you may not know about Bob, but need to know, is that he has attended more than 130 Bruce Springsteen concerts. As part of his work at MCF, Bob is leading an effort to promote inclusion and equity by strengthening democratic systems and civic engagement and, specifically, through advocacy to get Minnesota ready for the 2020 Census. 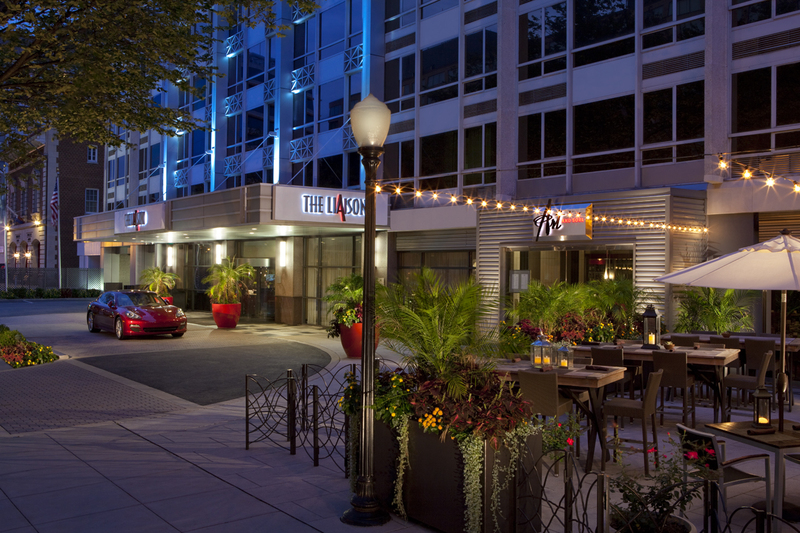 The Liaison Capitol Hill: A Boutique Hotel in Washington, DC's Capitol Hill is located in the shadow of the Capitol Building and near Union Station, The Liaison Capitol Hill is close to all the historic landmarks and attractions Washington, DC has to offer. Our room block is now closed but the hotel still has availability (as of February 7) at its regular rate. There is no discounted rate available at these hotels for Institute or FOTH attendees. The Kellogg Conference Hotel is located on the historic campus of Gallaudet University in northeastern Washington DC, approximately 1.5 miles from Capitol Hill and 2 miles from the National Mall. A complimentary shuttle to Capitol Hill is available for hotel guests. The Phoenix Park Hotel is minutes from the U.S. Capitol, Union Station, Smithsonian, Washington Monument and many more attractions along the National Mall. It is a three–block walk from the Liaison Capitol Hill Hotel. United Philanthropy Forum offers several unique sponsorship opportunities in 2019 to show your support for the philanthropic sector and reach more than 300 philanthropy leaders from across the country. To find out more, review our Institute and Foundations on the HIll Sponsorship Packet. Ready to introduce your organization to the Forum Network? Contact Maggie Osborn at (202) 386-6426. Hear from our policy experts on what key messages are being developed for legislative issues important to philanthropy and learn about how we can be most effective during our Hill visits by targeting key relationships and building our collective and state strategies. Hear from our policy experts on what key messages are being developed for legislative issues important to philanthropy that are in play and hear about how we should target key relationships and build our collective and state strategies to be most effective during our Hill visits. Join your colleagues to launch our efforts to organize FOTH 2019. Delegation Captains will receive updates and re-orientation on timelines, preparation, materials, issue prep and logistics for FOTH 2019 which will take place in Washington DC March 11-13, 2019. First-time and newer FOTH delegation captains should join this webinar to learn more about the history of FOTH and PolicyWorks Institute, what it takes to bring a group of your members to the Hill to represent philanthropy, and the issues important to your members in meetings with your state representatives. Interested in learning more about Foundations on the Hill? Please use the list below to find your state and the contact information for who to get in touch with for further information. Please contact Matt Hennessy at United Philanthropy Forum if you are interested in participating in a Hawaii delegation. Please contact Matt Hennessy at United Philanthropy Forum if you are interested in participating in a Kansas delegation. Please contact Matt Hennessy at United Philanthropy Forum if you are interested in participating in a Massachusetts delegation. Please contact Matt Hennessy at United Philanthropy Forum if you are interested in participating in a New Hampshire delegation. Please contact Matt Hennessy at United Philanthropy Forum if you are interested in participating in a North Dakota delegation. Please contact Matt Hennessy at United Philanthropy Forum if you are interested in participating in a Rhode Island delegation. Please contact Matt Hennessy at United Philanthropy Forum if you are interested in participating in a South Dakota delegation. Please contact Matt Hennessy at United Philanthropy Forum if you are interested in participating in a Utah delegation. Please contact Matt Hennessy at United Philanthropy Forum if you are interested in participating in a Vermont delegation. Please contact Matt Hennessy at United Philanthropy Forum if you are interested in participating in a DC delegation. Find out how you can be a part of FOTH on social media and share your own experience with important hashtags, tips for how to live report from FOTH and your Hill Meetings and sample tweets. A list of restaurants with private dining space close to the FOTH hotel. As a part of preparing their delegations for their Hill meetings, some regional associations put together 1-2 page highlights of each Member of Congress including biographical details, legislative priorities, recent media coverage of interest, committee assignments, prior activity, etc. To those unfamiliar with Capitol Hill, the titles given to staff of Members of Congress can be confusing. In order to enable you to be most effective in communicating with Congress, we have listed the most commonly used titles and principal functions of key staff in your Representative or Senator’s office. Position statements made by philanthropy-serving organizations in defence of endowed philanthropy. Visit Funders Together to End Homelessness to learn more about how philanthropy can help advance solutions that will prevent and end homelessness in our country. Visit the website of Forum Member Grantmakers Concerned with Immigrants and Refugees. Their site provides up-to-date resources and information to help you understand the issues and take action.